The 2013 walk had been an excellent walk on a super autumn day starting at the Moorcock Inn near Littleborough where we were staying and after a brief climb up to the White House (where the Pennine Way was joined) we all had an enjoyable stroll along the Pennine Way to Stoodley Pike. With a clear sky there was great distant visibility as far as Wales. The route continued by dropping down to Mankinholes and then joining the Rochdale Canal which was followed upwards passing the Great Wall of Todmorden and slowly climbing to Summit where a welcome beer was taken. The route then followed a cross country route back to the Moorcock Inn. Despite being a 16 mile walk the going underfoot was consistently good and after the initial climb to reach the Pennine Way there was remarkably little climbing involved and all the participants arrived back in good shape. Indeed this walk is to be recommended for anyone wanting a varied and interesting walk in this area. As a consequence, and with mainly the same group present for the 2014 walk, expectations were high for another enjoyable day when we met at the Masons Arms at Gargrave which, like the Moorcock, is a good place to stay with good accommodation, enjoyable and varied meals and well-kept real ale. The only fly in the ointment was that there was an adverse weather forecast for a wet morning and a showery afternoon. However all of us must have endured much worse forecasts while out on the Pennine Way and indeed it was a cheerful group who assembled at Gargrave station to catch the 9:30 train to Settle where the walk was to begin. After a short stop for provisions we commenced the steep climb up Banks Lane out of Settle which is the standard way to visit the famous Victoria Cave and after less than fifteen minutes, would you believe it, the rain stopped! By then we had left the bridleway of Banks Lane at GR 823641 where a distinct path heads north-east up a steep slope before easing up and turning eastwards. The scenery on the left up to Blue Crags and then Warrendale Knotts is top class and as a bonus we could also see Pendle Hill and the Lake District hills in the distance which boded well for the rest of the day. Soon we reached the junction of paths near Attermire Cave where the Victoria Cave can be reached by following the path under Attermire Scar. Our route however was Malham bound and followed the clear path east alongside a wall which then reached Stockdale Lane. This is followed in an easterly direction with the route passing to the north of Stockdale Farm. The hill behind the farm is Rye Loaf Hill which is 547 metres (1794 feet) high whilst the hill about half a mile further east is Kirby Fell at 546 metres high. Until recent times there was no legal access to these hills but fortunately they were included in the Open Access Area following the Countryside and Rights of Way Act (CROW) Act of 2000 passed by the Labour government. We were now at Nappa Gate which was an important junction in former days – this was the site of Nappa Cross which was moved and can now be found in the wall to the north of the gate on the track leading to Langstar Gate. The Stockdale Road track proceeds straight ahead down to Malham reaching the road near Malham Cove. Our route was the lesser path down Pikedaw Hill and is described in Wainwright’s “Walks in Limestone Country” (Walk 32). This is a highly recommended book for all those who wish to walk in this area which ticks all the walking boxes. Wainwright warns of the danger of the shaft which is 75ft deep near Nappa Gate which gave access to the calamine mines, an ore of zinc oxide, which are all round here. The calamine was used in the manufacture of brass. The path requires a little care when wet but overall is a joy with Malham two miles below you in the valley. An enjoyable lunch was taken in Malham, sitting in warm sunshine which was certainly far better than forecast and indeed summer conditions. We were now on the Pennine Way which gave a very pleasant afternoon walking the seven miles back to Gargrave giving a walk of about twelve and a half miles in total, on what is probably the easiest section of the Pennine Way. 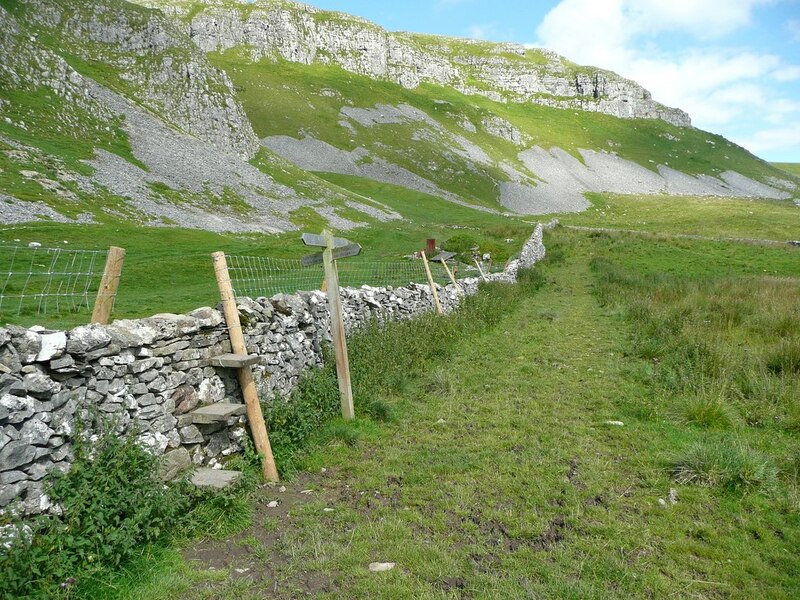 The section of this walk from Attercliffe to Malham follows the line of the Craven Fault, which marks the southern edge of the Limestone Dales, and this is illustrated and observed when descending from Nappa Gate where the land to the south is gritstone and wetter underfoot conditions compared to the limestone to the north. This geological fault runs from Austwick near Clapham and winds through Stainforth, Malham, and Kilnsey, terminating at Grassington. As far as l know there is no named walk or guide to follow this scar which is in superb countryside throughout, although there was a good description of this 45 mile walk in the Great Outdoors Magazine of March 1989 by Mick Chambers. 2015 is to have many walks celebrating the 50th Anniversary of the Pennine Way from several organisations such as the Ramblers Association, Friends of the North Pennine AONB , The Wainwright Society as well as the Pennine Way Association which are currently being organised and will be detailed when available on the PWA website and those of the other groups involved. This entry was posted in PWA News. Bookmark the permalink.